1. Always preferred Wolverine’s brown outfit over the yellow & blue one. I’m aware this is heresy. 2. And as if this whole thing weren’t gay enough: what’s with his GQ pose? 3. One chick? Don’t leave the toilet seat up, fellas. 4. Can’t identify axe-guy, “S”-belt or dude on far left –is that Quicksilver? Quasar, maybe? 5. Gotta wonder if it’s Rhodes in the armor –could really piss off any Teabaggers in the crowd. S-dude is the Sentry: Superman clone with power of a million suns (stupid). Yeah, and that’s not Wolverine, but his son. He fights people with pheromones and his gimp claws. I stopped reading Marvel shortly after seeing this picture. Comic books are dumb, but I’m damaged by nostalgia. Pheromones? Seriously? What, did Purple Man retire? This is from Dark Avengers, a series that wrapped up last year. Norman Osborn (Green Goblin) was deemed reformed and a hero after saving Earth, so they gave him the keys to the Avengers. He basically pulled a Thunderbolts and secretly filled the roster with villains. 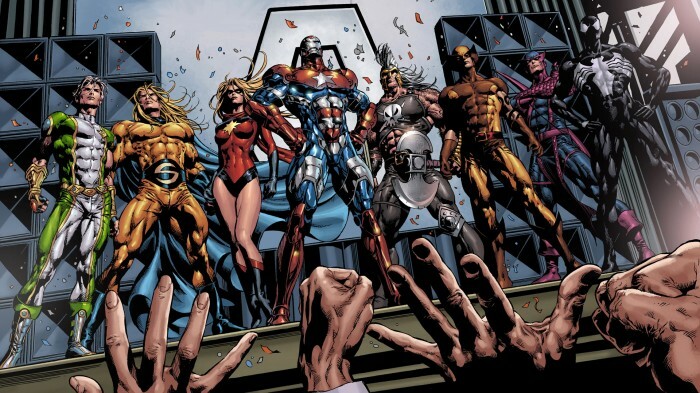 They are, from L to R: Captain Marvel(Noh-Varr), Sentry, Ms. Marvel(Moonstone), Iron Patriot(Osborn), Ares, Wolverine(Wolvie’s kid Daken), Hawkeye(Bullseye) and Spider-Man(Venom). It was an alright series; a fun idea with so-so execution. That actually sounds kinda interesting. Sorry, didn’t read all the comments before I posted, you said everything first and better. S’all good. I did enjoy the series, but especially that they were modeled after various actors(Osborn as Tommy Lee Jones was a stroke of brilliance, IMHO). Definitely one of the better storylines to come out of Secret Invasion. Is Wolverine’s kid an American? Canadian like dad? Dual citizen? Sociopathic Killer, Crazy Killer, Crazy Sociopath, Crazy Sociopathic Killer, Killer, Sociopathic Killer, Crazy Sociopathic Killer, Crazy Killer.